It’s a simple matter. 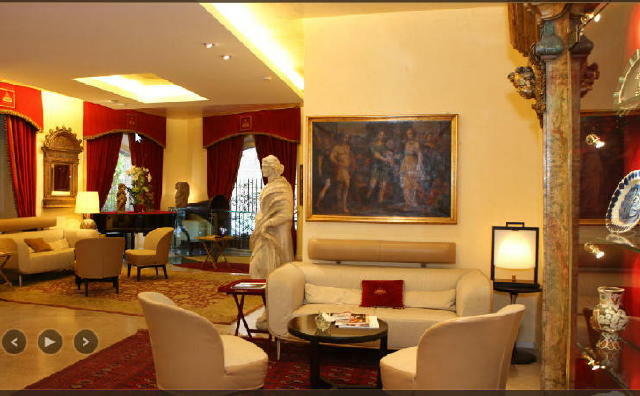 I’m in love with Rome and the Hotel Raphael. Currently living in the Seattle area in the flight path which arcs over an inner waterway called the Puget Sound, planes are visible on clear days as they climb and then level off to continue their journey to deliver their passengers to remote locations. My spirit takes flight with them, going aloft to dream a repetitive dream. 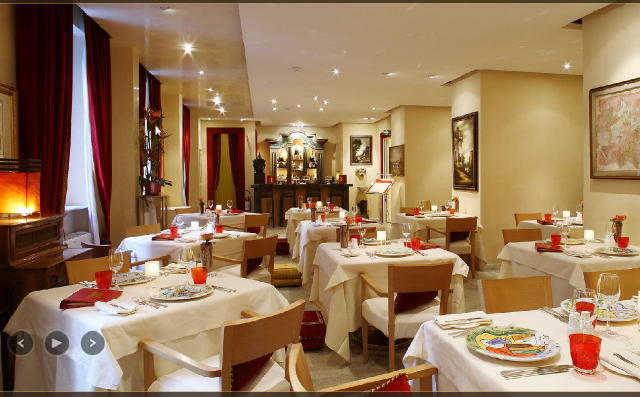 This "mind picture" is of returning to Rome, and of course, the Hotel Raphael-Relais & Chateau. 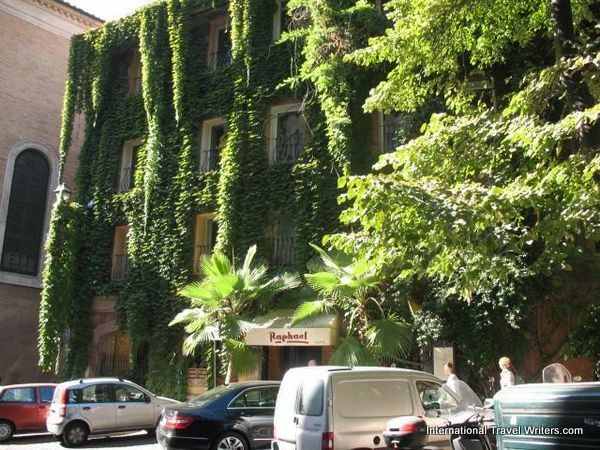 We made the discovery of this enchanting and stately hotel while enjoying an exploratory 12 hours in Rome in November of 2009 while on a port stop when we were en-route to Egypt. The cascading waterfall of Bougainvillea and ivy gracing the exterior was like a vision of the ultimate fusion of nature and grandeur. The immaculate care being taken by a bellman to sweep the outside walkway caught our attention and this whiff of sophistication emblazoned the emotional connection into my memory. 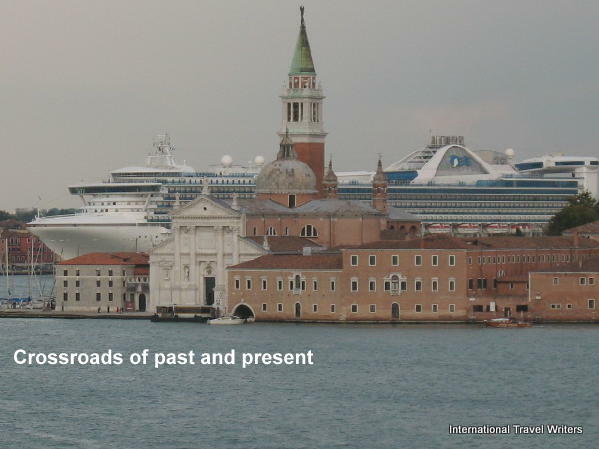 So our next cruise in October of 2011 (which started in Venice) was deliberately chosen because it ended in Rome. This meant we could spend a few days bathed in the elegance of this magnificent residence and its works of art we'd seen through the windows on our prior visit...before heading home. I want to stress that the Hotel Raphael had no knowledge of us and we received no freebies, discounts or preferential treatment. This hotel became the embodiment of what gracious, attentive and unsurpassed service should be and I opted to share this knowledge on our travel website. Having been a Director of Sales with Hyatt International Hotels in former years I like to believe that I recognize an establishment that should be vaulted to the top of a global menu of hotels. Although it seems like everywhere you look in Rome there are some historical buildings or monuments, occasionally, a particular site plucks at your heart strings and massages your soul…as if you are being transported to a different era. 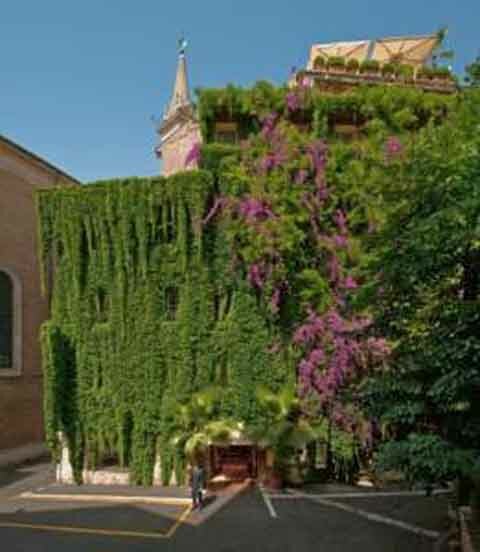 The Hotel Raphael, poised in Rome’s Renaissance district, is just such a place. The magnetic pull to the location intrigued me enough to delve into its historical past. The mix of discoveries was even more compelling and certainly deserving of being shared. 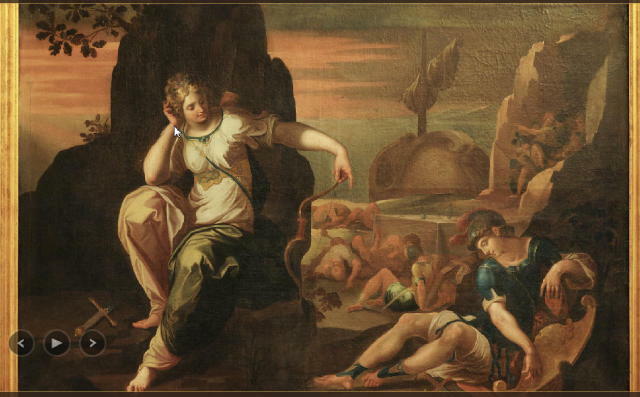 The ancient building, Largo Febo, is clearly depicted in a Vatican Museum fresco which shows it already in existence as part of the sixteenth century city’s urban fabric. The creator of the Hotel Raphael, Spartaco Vannoni who was born in Florence in 1922, had a vision of providing a setting for art on the same sophistication level as a museum. However, he was faced with the difficult task of a complete reconstruction of the interior of this ancient site while still retaining the eighteenth century façade which is a designated national monument. His vision, bathed in history, came to fruition and this stately hotel was completed the 20th of May, 1963. His inventiveness produced a structure with two below grade floors, seven spacious floors, a multi-leveled roof top terrace with a penthouse and restaurant. The art displayed in the hotel showcases paintings by Miro, Morandi and De Chirico, as well as lithographs, sculptures, antiquarian artifacts and a valuable collection of Picasso ceramics and Mayan art. Today, I see this hotel as a magnificent tribute to a man who made his dream a reality...and a superb legacy for his family who still run it. 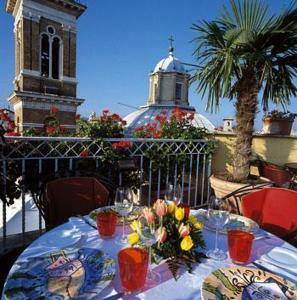 The Bramante Terrace Restaurant not only has excellent cuisine but offers a breath-taking view over the city of Rome. 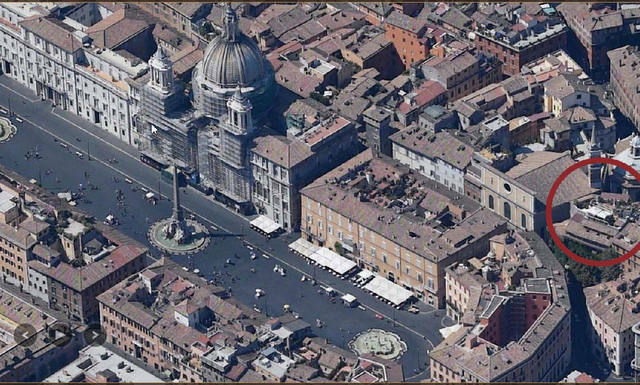 On the right hand side, not shown in this photograph but visible in the photo below, is a view of the dome of St. Peter's Basilica. We were fortunate that the restaurant was still open during our stay. We ate there on Oct. 15th and then again on October 17th, the night before our departure which was also the last night that it was open for the season because the air was getting crisp and chilly. They had tall heaters to warm the air and blankets to drape around your shoulders if your meal wasn't completed when the really brisk air settled in. Three things make this a very unique and special place...the waiters are professional and multilingual, tinged with a sense of humor...the food preparation is superb and offers succulent choices that you are able to pair with a wide variety of good wines...and thirdly, you have a panoramic and pivotal view of the skyline of Rome which is punctuated by the inclusion of the Basilica. These combine to make compelling reasons to linger. When the hotel's rooftop terrace closes its kitchen for the season there is still excellent fare in the Relais Picasso restaurant inside the hotel. Please note that you can still access the rooftop vista area for photo-taking opportunities during the daylight hours. The Roof Garden overlooks the Bramante Cloister of Santa Maria della Pace as well as the Church of St. Mary of the Soul, officiated by the Fathers of the German College and built in 1500 by Giacomo dell Porta. 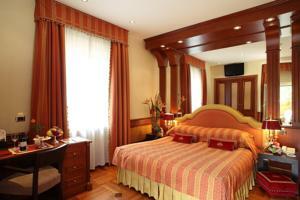 We chose the Hotel Raphael's Classic Double room and we weren't disappointed. I know that they have some rooms designed by the American architect Richard Meier which include an entertainment system by Bose but that contemporary look and feel wasn't our taste. We were in a classic city and we wanted to park our brains and feel more a part of the classic Rome. 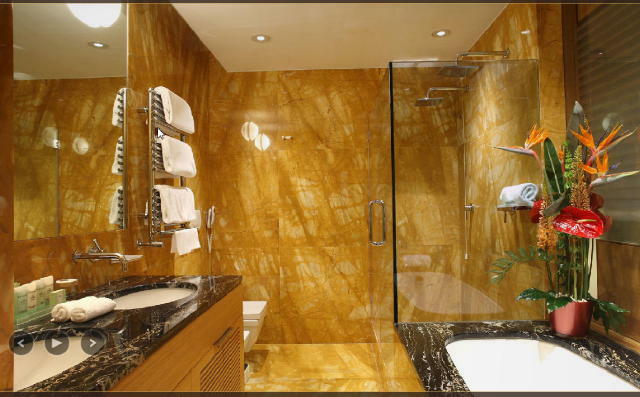 The room itself was luxurious and had marble bathroom floors and a tub large enough to soak those aching muscles after a long trek exploring the "Eternal City". The very elegant bathroom featured toiletries by Bulgari and having a bidet again is something I consider a treat when traveling in Europe. I became accustomed to them when I lived in Spain for a couple of years. In America we rarely have them in hotels so it's one of the amenities that I favor. Slippers and bathrobes were also supplied and they were plush and comfy. The room also had air-conditioning and a large flat-screen satellite TV and free Wi-Fi. The Wi-Fi presented me with an example of exemplary service...Hotel Raphael-Relais style. The buffet breakfast at the hotel is a mix of tasty and tempting offerings accompanied by trays of freshly cut fruit. An added plus was everything was replenished constantly. 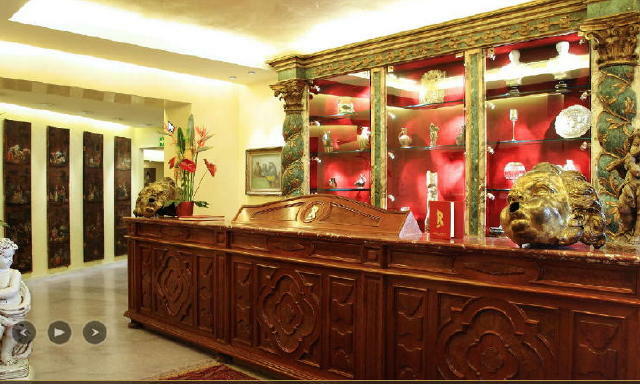 The Hotel Raphael concierge services were handled by the very amiable and dedicated front desk staff. When we asked questions about both the Colosseum and the Vatican they took care of getting us reservations at the times we specified. They also arranged for a private car to take us to the airport when we were departing. The private car was the same price as a taxi so it was a wonderful suggestion we opted to take. This is a 5 star hotel and as such, it isn't inexpensive but it offers a tremendous value. 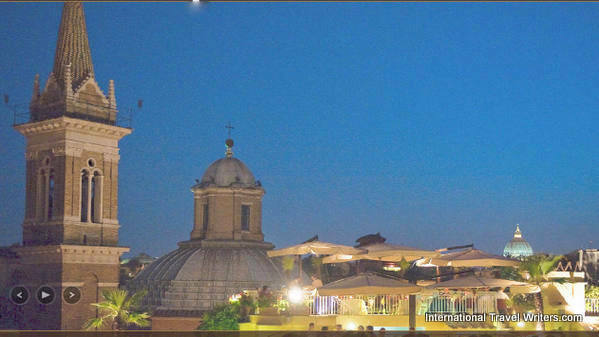 It is located right in the heart of the Piazza Navona and within easy walking distance to Trevi Fountain, Pantheon, Colosseum, Roman Forum and the Vatican, to name just a few. 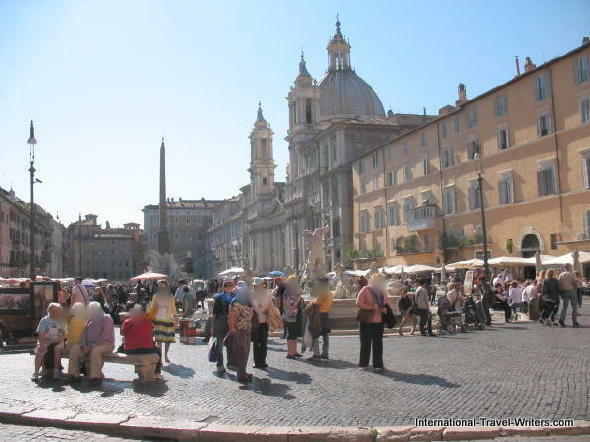 You walk just a short block and you are in the Piazza Navona amongst the sidewalk cafes and trattorias so taking taxis isn't really required. 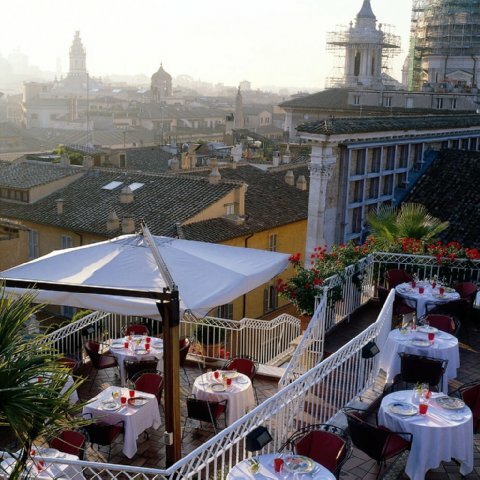 We've decided we need more time to experience the many facets of Rome so if you hear, or read on the website that we have left for Rome, we can be found at our favorite haunt in Rome...the Hotel Raphael-Relais & Chateau...probably dining and relishing a good glass of wine on the rooftop's Bramante Terrace restaurant.